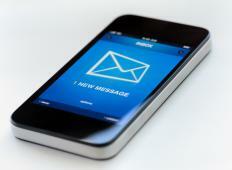 Voicemails are typically stored in a database, sent to the recipient’s email, or forwarded to a mobile device. Online voicemail records and stores phone messages on the Internet. Customers can set it up to work in a number of ways, possibly receiving free access with some products. This can be useful for mobility and flexibility, where it may be useful to be able to access voice messages via any Internet-enabled device. With online voicemail, when people place calls to someone who is not available, they can opt to leave a voice message. Their message is recorded and may be stored in a database, sent to the recipient’s email, or forwarded to a mobile phone or device. The recipient can retrieve messages by entering a user name and password, which provides security to ensure that messages reach the intended target. It may be possible to store, forward, and perform other actions on the message. Some systems convert online voicemail to text messages with transcription services. These can be sent as emails for those who do not want to listen or are not in an environment where they can do so. This can be useful for prioritizing callbacks, as people may be able to quickly scan transcripts to determine which calls require immediate action. They can also refer directly to the transcript instead of having to take notes if the message was complex. Using an online voicemail system, people can control where their calls are routed. Someone might have separate numbers for work and home, for example, and can set up an online answering service to push calls to a mobile phone or landline, or send them to voicemail. They can also establish different outgoing voicemail messages for their separate lines, or even individual callers. This can be useful for activities like setting an away message on a work phone line while on vacation, or forwarding calls from specific people to an assistant. Pricing for online voicemail can vary. Free services are available, although they may have limited options. Paid services can come with a wider variety of options that may include multiple lines, custom outgoing messages, transcription, and so forth. Consumers may want to comparison shop between services to learn more about their options and determine the best choice for their needs. If online voicemail is work-related, an employer may be willing to pay for it, or could be required to if the employee can demonstrate that it is a necessity to complete assigned tasks. What Are the Different Types of Voicemail Transcription? What Are the Different Types of Voicemail Forwarding? What Is a Digital Answering Machine? How Do I Choose the Best Voicemail Providers?